Successfully Added VKWorld T5 Smartphone - 5 Inch HD Screen, Android 5.1, Bluetooth 4.0, Gesture Sensing, Smart Wake, Dual SIM (Gold) to your Shopping Cart. Looking for a smartphone that has all the important feature, good looks and a nifty little price tag? Well, today is your lucky day. 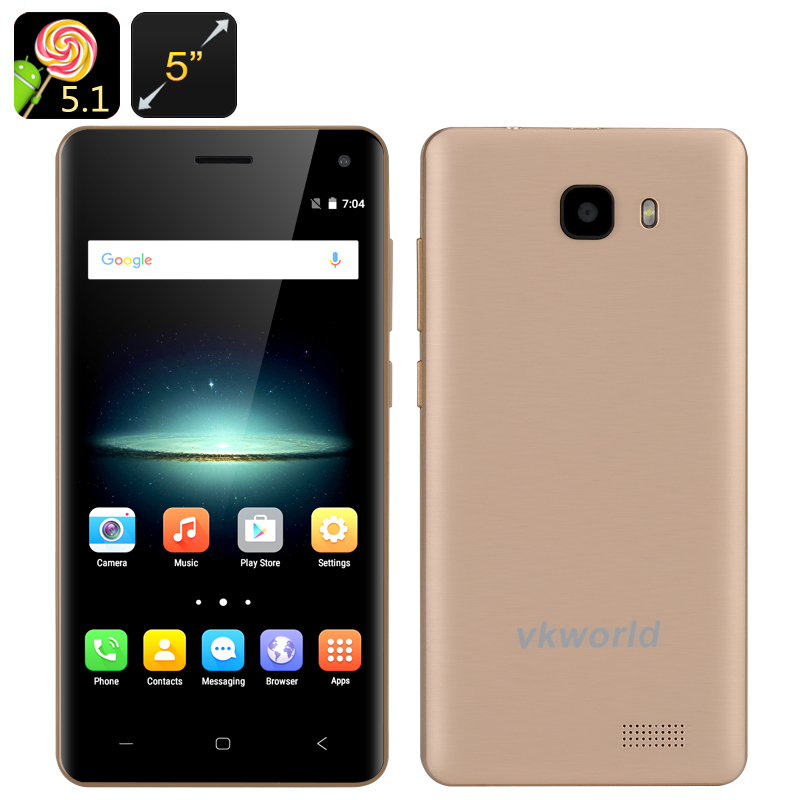 The VKworld T5 Android smartphone comes with a 5 inch HD screen, 3G network support on two SIM cards you can use simultaneously, a powerful quad core CPU, Smart Wake, Gesture Sensing and more! All for under $60. The VKWorld T5 has everything you might need in a modern smartphone: a large screen, a strong processor, a nice intuitive interface, Play Store access — and that’s not even the best of it. Sporting 3G connectivity on two SIM cards, the smartphone lets you easily separate your work and pleasure by conveniently having two accounts on one device. Smart Wake and Gesture Sensing make up another highlight. With Smart Wake, all you need to do is draw a letter on the smartphone’s locked screen and you will get instant access to the preset apps. Gesture Sensing lets you control your apps with a simple wave of the hand, like skipping music tracks or flicking through recipes great when your hands are messy..
Having a 5 inch HD screen is superb for media fun. You can watch movies, go through your photos and videos, browse the web and more. With Bluetooth 4.0, you will have stable connection with other Bluetooth devices and can always hook up a pair of wireless earphones or Bluetooth speakers. The phone comes with a 2000mAh battery - good for up to 6.5 hours of continuous talk time and 200 hours on standby. The smartphone also comes with two cameras.